Surely, everyone who is not new to fitness for a long time already knows that a real training is when after it you have your entire body burning, your face is red and you experience the most incredible emotions, because you know that you are cool! Do you agree with us? But what if you do not get the real effect from your workout? In this case, you need to make changes to your workout routine, adding something that makes you feel a real burn. How about finisher workout? This workout consists of two to five moves, it’s a mini workout to tag on to the end of any sesh with the aim of expanding those last energy reserves in the most intense way possible. The benefit of finisher workout is that it helps to burn a huge amount of calories in a short time. As the intensity increases, your body taps into its anaerobic energy systems to build lean muscle. Perhaps you will find that this is a difficult way, but believe us, it's worth it! Well, are you ready to change your workout routine for the better? 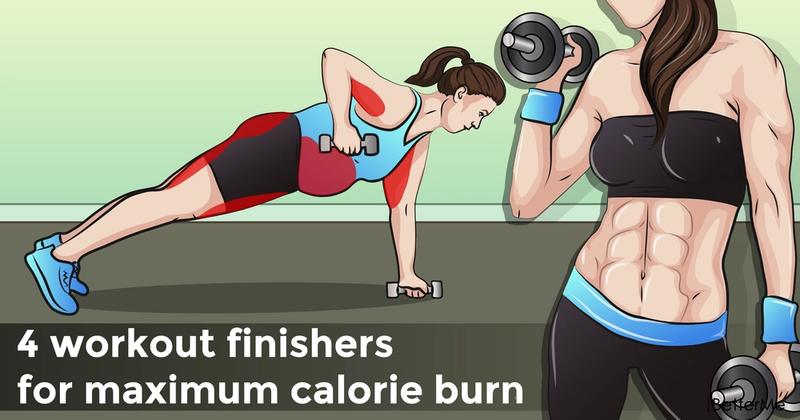 If so, we have prepared a list of 4 workout finishers that will help you get the maximum calorie burn. Scroll down to see the instructions how to perform each move correctly in order to avoid injury and stretching. Just do it, babes!